August 4, 2015 /11 Comments/in Crafting Tips, Kid's Crafts /by Craft Supplies for Less, Inc. If you were a kid in the 80’s or had kids in the 80’s than you almost certainly remember Makit & Bakit Sun Catchers! These are the sun catchers that you pour the baking crystals into the metal frames and then watch as the crystals melt in the oven to make a sparkling sun catcher for any window. Although we have sold these kits for years, we thought it may be helpful to provide a few tips along with step-by-step instructions to help you make these kits with less frustration and more success! That being said, here are a few tips that will help to minimize frustration and make these crafts more enjoyable to create with kids! Pour Baking Crystals into small bowls/tins & use a Mini Spoon to fill metal frame. 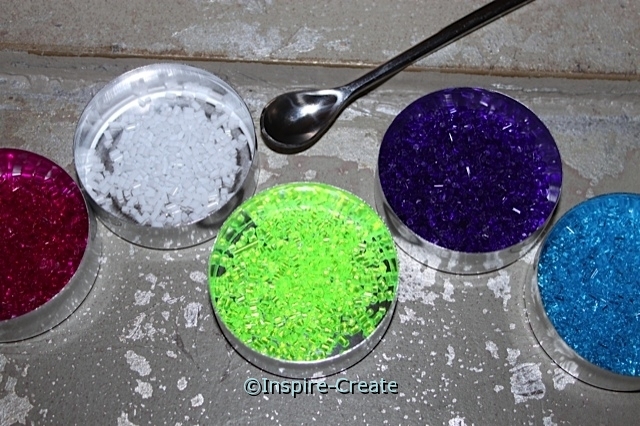 We find it very helpful to pour all the baking crystals (by color) into small bowls or tins. Once the baking crystals are in tins, they can be scooped and poured with a tiny spoon into the metal frame. This also helps prevent spills and having to pick up thousands of tiny baking crystals! 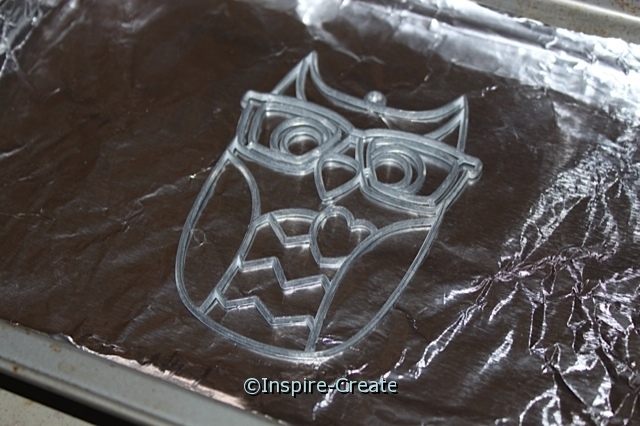 Use a flat cookie sheet lined with a smooth piece of foil. 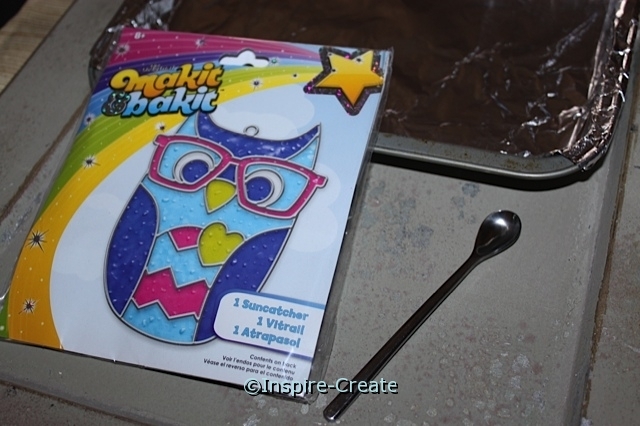 Fill the Makit & Bakit Frame on a flat aluminum cookie sheet lined with a smooth piece of foil. The flatter the surface the easier it will be to fill the frame with baking crystals and keep them all in place. Before you begin to fill the frame make sure the frame doesn’t wobble or rock on the cookie sheet. If it does, adjust the frame until it is completely flat. One tiny baking crystal under the frame and you will have to start all over! Use a Mini Spoon, Toothpick, and a pair of Tweezers to place the Baking Crystals into each part of the metal frame. 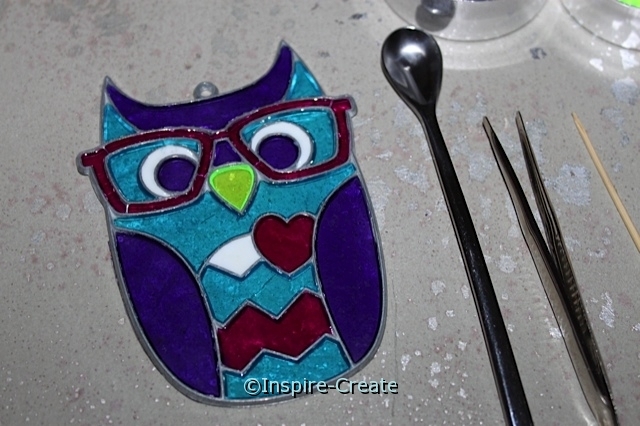 A mini spoon works perfect for filling in the larger part of the metal frame with crystals. Tweezers and a toothpick help a lot with all the smaller areas of the sun catcher frame. Below the Eye Glass Frame and Eyes were filled by using tweezers and a toothpick. 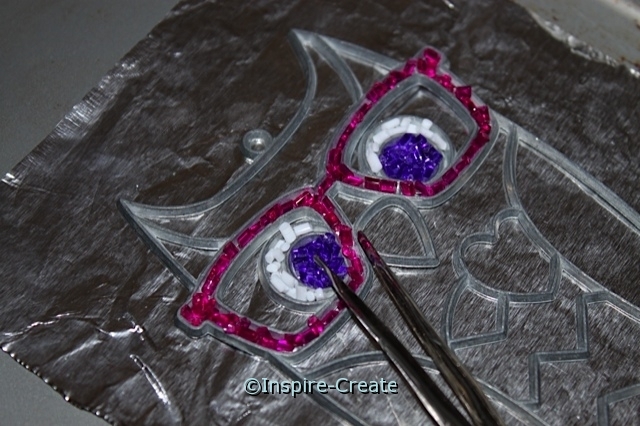 Add Baking Crystals to the smallest part of the frame first! 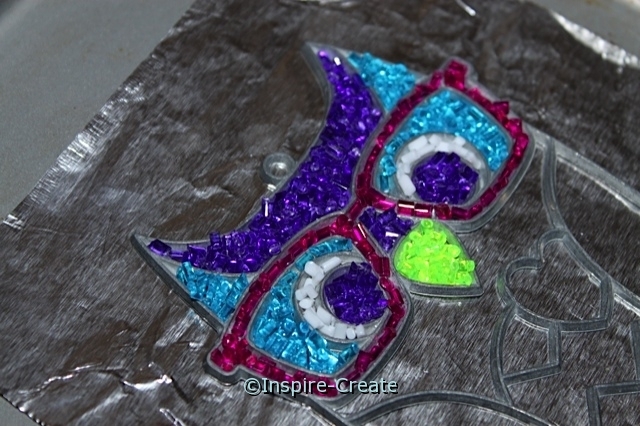 Start by filling in the smallest areas on the sun catcher first! After much practice, we found this can save hours of starting over! If you fill in the larger parts of the sun catcher frame, then fill in the small parts and accidentally bump the frame at all, you risk messing up the entire creation and having to start over. Therefore, get the hard part done 1st before moving on to the larger areas. 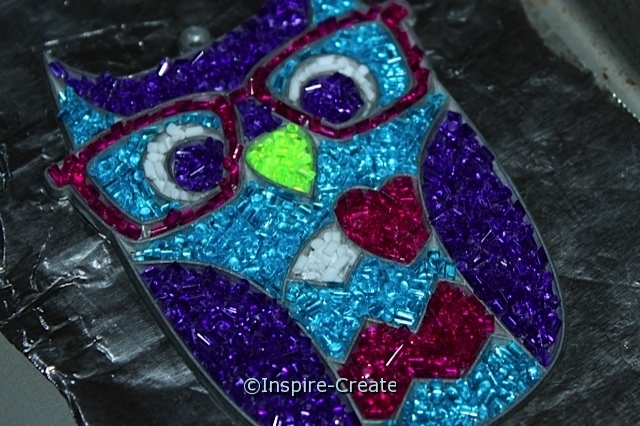 For the glasses on this Owl Sun Catcher, we had to place the baking crystals into the frame 1 at a time and then move them around with the toothpick until the frames was filled. The larger areas are much easier to fill with the tiny spoon. FYI: You don’t want to be able to see the foil below. If you can see the foil, make sure you add more crystals to the frame! Don’t bump or move the frame at all while filling in the baking crystals! Make sure to never lift the frame from the cookie sheet while you are filling it with baking crystals. If any baking crystals get under the metal frame, it will cause the frame to lift which will mess up all the baking crystals and you will have to start over! This is the last thing you will want to do after you have spent so much time carefully filling in the colors you want in each part of the frame! Not to mention it isn’t much fun separating all the tiny baking crystals back into their matching tins! Fill the Makit & Bakit Frame close to the oven you will cooking it in. The closer you are to the oven, the less likely you are to bump or ruin the sun catcher while transferring it! One little bump or any movement at all can cause the baking crystals to shift and ruin all the hard work you have just done. We have mentioned this already, but seriously all it takes is 1 tiny baking crystal under the frame to lift the entire thing and you will have to start over from the beginning. Use a standard kitchen oven. Do NOT Microwave or attempt to use a toaster oven. AIR BAKE cookie sheets are not recommended (they will add time to the baking process). Unbaked baking crystals and frame can not be transported to another location (yes we have actually been asked this) to bake. The closer the oven is, the better! Moving an unbaked sun catcher kit can cause the baking crystals to shift under the frame and then you will have to start over. 1) Pre-heat oven to 375 degrees. Use a standard oven. Do NOT attempt to microwave the metal frame and baking crystals or use a toaster oven. 2) Cover a flat cookie sheet with a smooth piece of aluminum foil. 3) Place the flat side of the metal frame down on the aluminum foil. Make sure the frame doesn’t wobble or rock. It must be completely flat in order to fill it with crystals successfully. 4) Use a Tiny Spoon, Tweezer, and a toothpick to place the baking crystals in each area of the metal frame. Fill each section until you can’t see the foil underneath. If you can see the foil fill with more baking crystals. If you don’t fill these in completely, there will be a hole in the sun catcher after it bakes. ***Make sure to leave the hole empty for hanging the sun catcher when it is done. 5) Once all the areas of the sun catcher frame are filled with baking crystals, transfer the cookie sheet to the oven very carefully! Place it in the center of the oven. 6) Bake approximately, 15-25 minutes, until the crystals are melted and smooth. Keep the frame in the oven until all the crystals have melted. The darker color baking crystals may take longer to melt. ***If you notice areas of the frame that aren’t filled in with melted crystals, you can attempt to fill these areas in with additional crystals. However, use extreme caution as the frame and melted crystals are extremely HOT! 7) Once all the crystals have melted, remove the cookie sheet from the oven and allow to cool, approximately 5-10 before peeling off the foil. 8) Attach your own string or ribbon to the metal loop, hang in a window, and ENJOY all your hard work! One of the great things about these sun catchers is that they last for years! 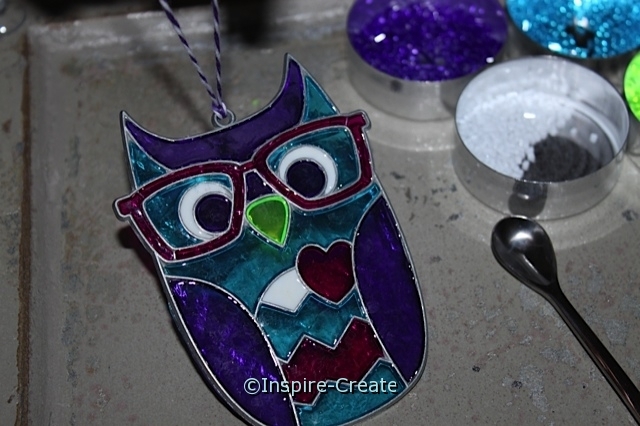 Unlike most crafts that kids make and throw away not too long after they are done, Makit & Bakit Sun Catchers can be enjoyed in a window for years and make great gifts too! Buy Makit & Bakit Sun Catchers, Ornaments, and Kits for Less! I have one if these kits a made years ago. My cat is a jerk and knocked it out if the window, and some of the colored areas popped out or broke. I found them all and they fit great. My question is can I rebake it to repair it. Hi Joan! We have never tried to re-do a Makit & Bakit Sun Catcher although we have been asked this question before! You could attempt to get the melted crystals out of the section that is broken and file the edges smooth with a nail file up to the metal frame, then fill it with new baking crystals, and bake it. Make sure you don’t over bake it the 2nd time as the crystals that are already melted can discolor, so watch it closely. Please let us know if you try this and how it comes out so we can let others know! Good morning ! First off, I recieved a box ful of Makit-Bakit crystals ( Every color you could possibly think of, and then some!) What I didn’t recieve was the frames! Now to my question: Can I make the frames out of tin ?? Or should I say, The Hell With it! ( LOL ) Thanks! Sorry for the delayed reply. For some reason your question was missed. You can make Makit & Bakit Bowls with Pie Tins and Baking Crystals. Also, we have filled bottle caps (the kind without the plastic liner) with baking crystals and melted them to make cute magnets. We do have a few frame only kits left that you could use the crystals on too. Hope that helps. I have a solution for the shifting tin frame. Sticky tack is heatable up to at least 500 degrees. If you put a few dabs around the frame (not under) it wont slide around. Works like a charm. Saves frustration. Hi ladies, what I’m looking for is the “original” name of this crystal beads baking kit. I had one in the ’70’s but makit bakit wasn’t the name. Should all the crystals be used or is it intended to have extras? If I have extra, have we not filled the spaces enough? Hi Erin! Usually they provide more baking crystals than needed. Make sure you have each area completely filled (see our photos above) so when the baking crystals melt there are no spaces. I happen to have bought some completed/baked Makit & Bakit suncatchers from a thrift store intending to break them down and reuse them in another way. Do you think this is possible? If you’ve done it before, what tips or tricks have you learned? Especially in trying to break down the “panels” of baked crystals for reuse. Any help is appreciated and thank you for taking the time in reading this. We have not done this before. Please share how they turn out and any tips you might have when they are finished. We would love to know!